Well, here it is dark outside. I’m sooooo tired and have been doing all sorts of things today. Luckily, it’s Microblog Monday! 1. I need to allow this post to be imperfect. 2. I need to learn photoshop. Another hard thing that we did today to make things easier in the future: Pupper and I walked to visit friends who have a new big dog, in addition to their old big dog with whom we are already friends. It was a barking, growling fest as three shelter dogs got to know each other. It was rough, as we two dog moms sometimes feel that we were raised in shelters too. Everyone getting altogether too frazzled. Too fast. Too much. Dogs barking and growling. So tiring. We thinking we might be doing it wrong. Most likely, they’ll all three be hanging out happily in a couple of weeks or maybe sooner. It was FH’s last day at a job where his boss has been less than pleasant toward him for two years. So hoorays were in order. A lovely Indian Buffet Feast. So full. I know that the new job will be so much easier. FH and I seem to have let this grouchy person invade our relationship somehow. I think that the unpleasant boss has been projecting his anger onto FH, and then FH projecting it on to me, and then me, acting frustrated and confused. Maybe I’ve had too much therapy, but the fact remains that if people don’t express their bad feelings, someone else winds up experiencing those feelings and it’s not fair or fun. It’s weird. I’m burning sage like a madwoman to clear the air! Life as an empath. Very strange. 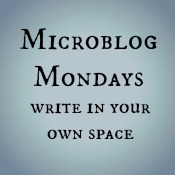 This is turning out not to be very micro, but here’s the lovely badge for MicroBlog Mondays! This entry was posted in blogging, dogs, nablopomo, nature, pets, photo 101, photography, Uncategorized and tagged beauty, blogging, dogs, fibromyalgia, healthy, nablopomo, nablopomolove, pets, photo 101, photography, photography101 by Project Easier. Bookmark the permalink. You captured micro here brilliantly!! Brava!! My hubs has been having a few tough years at work and we find it seeps into our home life. He comes home exhausted and wiped out. Eventually he lets it out and I take the brunt of his unhappiness. It’s not fair and I get angry but I hope new oppiortunities are on the horizon for him as well and he can find a happier place to work. Congratulations on your husband’s new job. May it bring less stress (and more Indian food celebrations). I really like the yarn photo above.